With remunerations as high as hundreds of thousands of dollars and no peer-reviewed publications or communication on the part of the historians hired by the tobacco companies the question arises whether some historians are willing to trade their reputation and that of their university for the benefit of an interested party. Bringing historical and contemporary issues together. Unlocking documentation on the involvement of historians as expert witnesses. Which historians are working as expert witnesses in litigation. 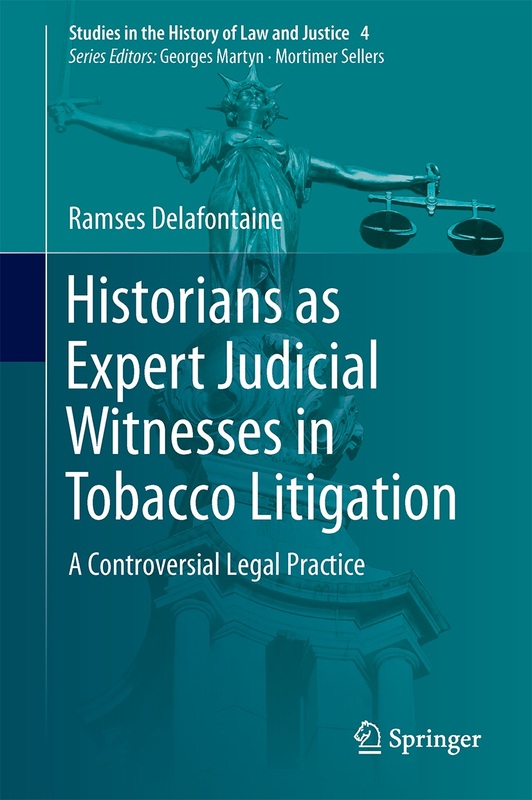 Historian Ramses Delafontaine presents an engaging examination of a controversial legal practice: the historian as an expert judicial witness. This book focuses on tobacco litigation in the U.S. wherein 50 historians have witnessed in 314 court cases from 1986 to 2014. The author examines the use of historical arguments in court and investigates how a legal context influences historical narratives and discourse in forensic history. Delafontaine asserts that the courtroom is a performative and fact-making theatre. Nonetheless, he argues that the civic responsibility of the historian should not end at the threshold of the courtroom where history and truth hang in the balance. The book is divided into three parts featuring an impressive range of European and American case studies. The first part provides a theoretical framework on the issues which arise when history and law interact. The second part gives a comparative overview of European and American examples of forensic history. This part also reviews U.S. legal rules and case law on expert evidence, as well as extralegal challenges historians face as experts. The third part covers a series of tobacco-related trials. With remunerations as high as hundreds of thousands of dollars and no peer-reviewed publications or communication on the part of the historians hired by the tobacco companies the question arises whether some historians are willing to trade their reputation and that of their university for the benefit of an interested party. The book further provides 50 expert profiles of the historians active in tobacco litigation, lists detailing the manner of the expert’s involvement, and West Law references to these cases. This book offers profound and thought-provoking insights on the post-war forensification of history from an interdisciplinary perspective. In this way, Delafontaine makes a stirring call for debate on the contemporary engagement of historians as expert judicial witnesses in U.S. tobacco litigation.